Fine Art Handcrafted Jewelry at affordable prices. a combination of semi precious stones, glass beads and seed beads. All the styles are handcrafted and designed by us and our team at our workshop in Ibarra, Ecuador using supreme quality gold tone, tarnish resistant wire and a combination of semi precious stones, glass beads, and seed beads. If you are looking for unique, and elegant designs in jewelry at affordable prices you won't be disappointed. Our vision is to provide women with a way to look glamorous, classy and beautiful at affordable prices. At the same time our mission is to provide a source of income to the less privileged women who find it difficult to find employment because they are either handicapped, single mothers or those who don't have much education. In doing so we are contributing to the dignity and empowerment of our fellow females. We want to show them and the world that, YES WE CAN! 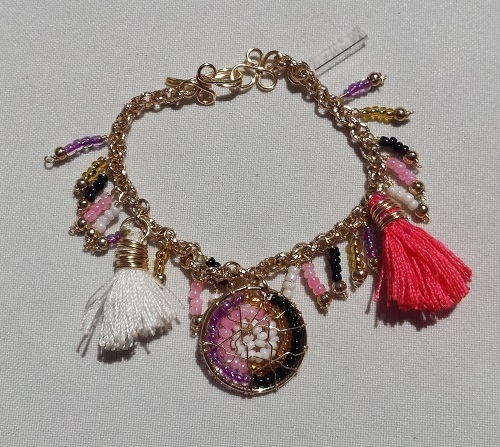 Dream catcher, and charms are hand made using gold tone tarnish resistant wire and pink, iridescent black and white seed beads. Pink and white thread tassels, and gold tone aluminum chain. The dream catcher is hand woven. Each individual seed bead charm is also hand made as well as the thread tassels. Bracelet is adjustable. The Artist team of Susana Velez and Stephanie Vargas Professional Artists Fine Art Handcrafted Jewelry at affordable prices. a combination of semi precious stones, glass beads and seed beads. All the styles are handcrafted and designed by us and our team at our workshop in Ibarra, Ecuador using supreme quality gold tone, tarnish resistant wire and a combination of semi precious stones, glass beads, and seed beads. If you are looking for unique, and elegant designs in jewelry at affordable prices you won't be disappointed. Our vision is to provide women with a way to look glamorous, classy and beautiful at affordable prices. At the same time our mission is to provide a source of income to the less privileged women who find it difficult to find employment because they are either handicapped, single mothers or those who don't have much education. In doing so we are contributing to the dignity and empowerment of our fellow females. We want to show them and the world that, YES WE CAN!